It is sometimes a bizarre thought to ask how Roman was Roman Britain. However it’s a valid question, a good question and one that can be rather hard to answer. Whenever you think of Roman Britain the amazing archaeology of Hadrian’s wall, the baths at Bath, or the impressive remains of Roman villa’s spring to mind however these remains are not the whole story. Outside of this version of Roman Britain exists a large range of lower status settlements many of which show few of the improvements and characteristics of the recognisably Roman way of life. Take Tewkesbury for example, a small town in Gloucestershire, one of the major heartlands of the Roman Villa, but a large number of rural settlements evident here is far from what most would recognise as being Roman. Small scale habitation occurred across the area and continued across the conquest however there were no sweeping changes here. At Walton Cardiff, one of the most active occupation areas in the Tewkesbury environment, the natives continued to live there across the conquest and did so in typically British roundhouses for 300 years into the occupation when habitation disappeared. Furthermore the small finds record was predominated by the natively influenced Severn Valley Ware pottery with the more characteristic Roman fabric such as samian ware nowhere near as common. Underneath the modern town, Roman period archaeology has been revealed on a few occasions and these occasions too have portrayed a lifestyle more akin to poorer farmsteads than elaborate town houses or villas. The buildings here appear to have been timber framed, wattle and daub constructions, nothing impossible in Britain prior to AD 43. There were some unstratified scatters of more elaborate archaeology, in particular some painted plaster but insofar no building has been identified for this. These examples are just a few ways in which Tewkesbury would appear to be rather un-Roman however to call it totally British would be an injustice. 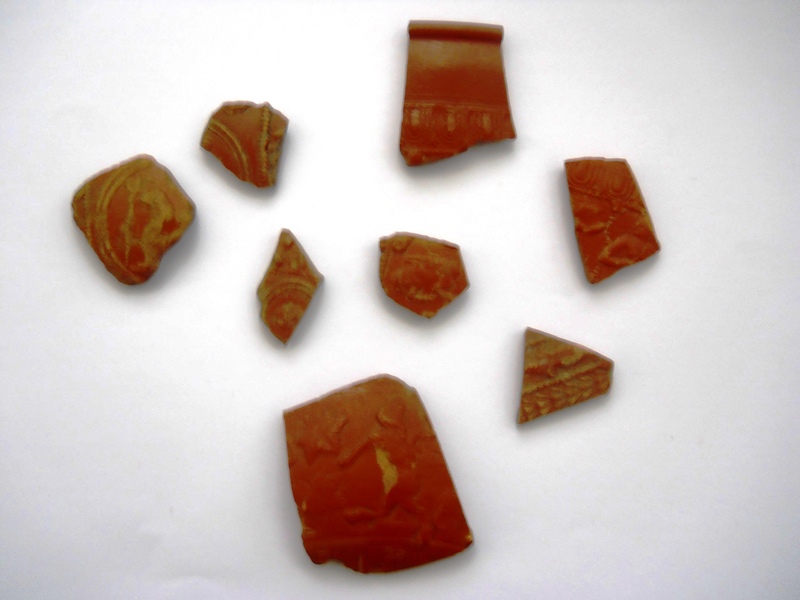 There is some evidence of Romanisation in the small number of classical samian ware sherds and the large number of Roman coins reported in the town over the years that attest to the intensified economy and improved trade routes. 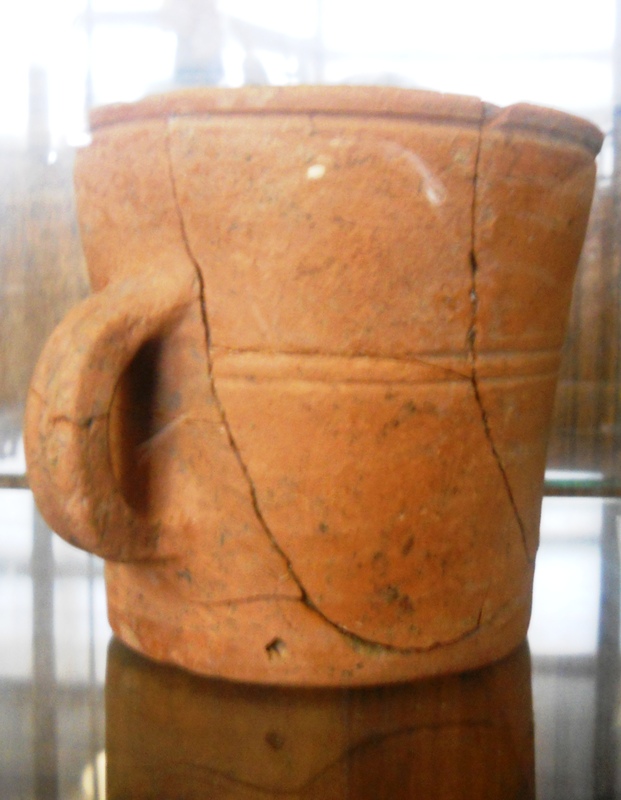 A small collection of more typically Roman pottery: Samian ware. Ultimately Tewkesbury demonstrated a hybrid culture, a Romano-British culture and this is something that’s repeated across the country. Postholes and ditches may not be as impressive as mosaics and masonry but they are just as important in studies of Romanisation and in many cases reveal a Romano-British culture where the British part was by no means small.